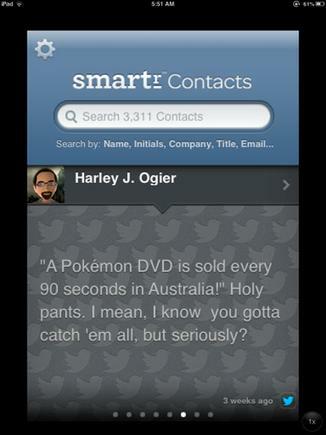 Smartr is a contact app for iOS from the creators of Xobni for Outlook and Smartr for Gmail. Like Xobni, the idea is to pull together all the information you have about your contacts in smart and useful ways. When you install the app, it asks you to log into your main email addresses and social networks. Adding multiple Gmail addresses is possible, but you have to log out, and then log in to the next one to do so - which is a little annoying. Once all your addresses are in there, however, the "smartr" part of the app takes over. If you enter a contact name into Smartr, it will do what you expect, which is to bring up the contact information, collating it into a list of phone numbers, email addresses, Twitter handles, and the like - and offering the ability to send a message via any of those options. It also shows their most recent location. But the two additional tabs, labelled History and Common, do a bit more. Under History, I can find how many conversations I've had with someone, and when we first contacted each other - including the subject line. There's a list beneath of most recent conversations - scroll down and you'll see them all. While that's not so useful if your first contact was "hi! ", it's great if you're looking up a project-based contact. Swipe the information, and you find a handy chart of how much contact you've had over the last year. It's not quite as fine-grained as Xobni's trick of telling you what time of day someone is most likely to send you an email and handing you their publicly accessible LinkedIn information without prompting, but it's not bad. The Common tab shows you people that you and a contact may both know - I clicked on my sister's contact information, for example, and under Common it showed me not just my parents and siblings, but also her partner and friends of hers that I might be expected to know based on the fact that she's emailed both of us with a single conversation at some point. I found a couple of new contacts that way. Smartr is not all-seeing, however. It bugs me that I can't figure out Smartr's "rules" to ensure that the information I want is available to me, and I'm concerned that even apparently complete profiles might be incomplete in ways I haven't realised. It's still useful, though, and I'm likely to keep using it for the way it offers me alternate ways to interrogate my contacts database. Past experience tells me that Xobni is very forthright about listening to issues and fixing them, and this is a very new app - I remember talking to the CEO in 2009 about the possibility of bringing out a Xobni iOS app, and the multiple issues that prevented it for a long time. It's great that Xobni has solved enough of the challenges to bring out something that is integrated and adds some of the company's usual "surprise and delight" usefulness. I can't quite recommend it, yet, though I want to suggest you give it a try and forgive it a few teething troubles. In reality though, you're probably best off waiting for the next version. *Baxter is edtior of PC World NZ.